Closeup of Mangroves at Biscayne, View from the rampart of Fort Jefferson, Dry Tortugas. As with all Florida visits, but especially with these outdoor activities, the best time to visit is from November through April. This is Florida’s “dry season” when temperatures are somewhat tolerable and humidity is within reason. In the wet season, mosquitos and heat become unbearable and there’s always the threat of those pesky hurricanes rearranging the landscape. We traveled to Everglades by car the morning after our Miami arrival. Alamo rental car in Miami Beach had the best rates in the area, and gave us a free upgrade to a compact crossover at pick up. It’s an easy hour and a half drive to the Ernest Coe visitor center at the park’s eastern entrance. There are also visitor facilities at Shark Valley and Everglades City, but for a one-day visit, the road from the Coe Visitor Center to Flamingo provides the most opportunities for exploration. 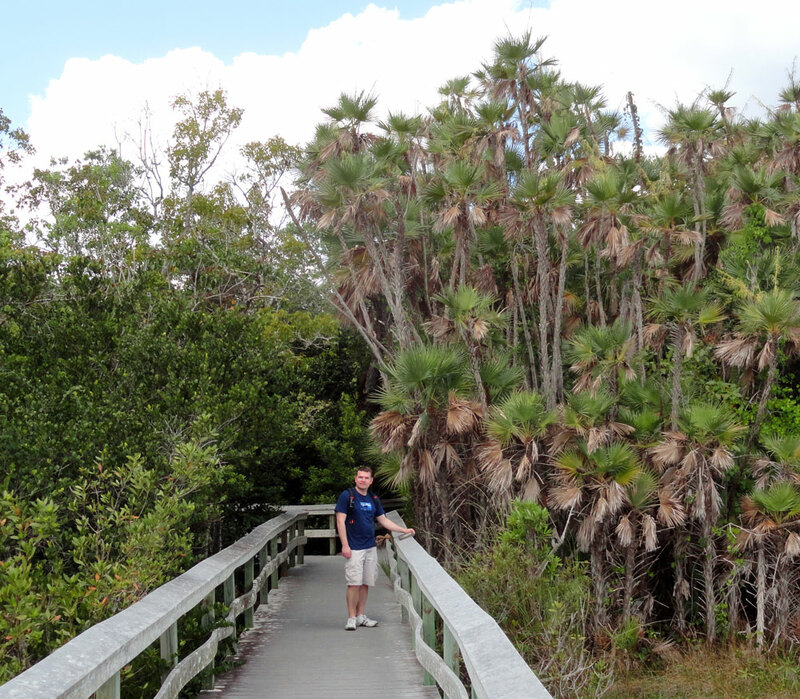 We made our first stop at Royal Palm where the Anhinga Trail and the Gumbo Limbo Trail give a great introduction to Everglades animal and plant life. Along the Anhinga boardwalk, we saw alligators, vultures, herons, egrets, a turtle and of course lots of anhingas. It’s an easy 0.8 mile walk you can do on your own or on a ranger-led tour. The Gumbo Limbo trail is named after the tree that grows in the tropics of the Americas (this is its northernmost location). The trail winds through a thick grove of trees known as a hardwood hammock that forms an important habitat for a diverse range of life. 15 miles further into the park is Mahogany Hammock, home to the largest living Mahogany tree in the country. Another short boardwalk loops through for closeup views of dense foliage. Dolphin fin poking out of the water in Tarpon Creek. Flamingo is located on the southern coast of the Florida peninsula 38 miles from the park entrance. It contains another visitor center, a campground and a small cafe where you can eat fried alligator right after viewing them in their natural habitat, yum. The area used to have a larger restaurant and lodging, but hurricane Wilma had other plans and wiped them out with a 9-foot storm surge in 2005. Flamingo is also where we booked the backcountry ranger-led boat tour that we highly recommend. Morning and afternoon trips depart hourly (seasonally) on pontoon boats that take guests up Buttonwood Canal, across Coot Bay, through Tarpon Creek and into Whitewater Bay. 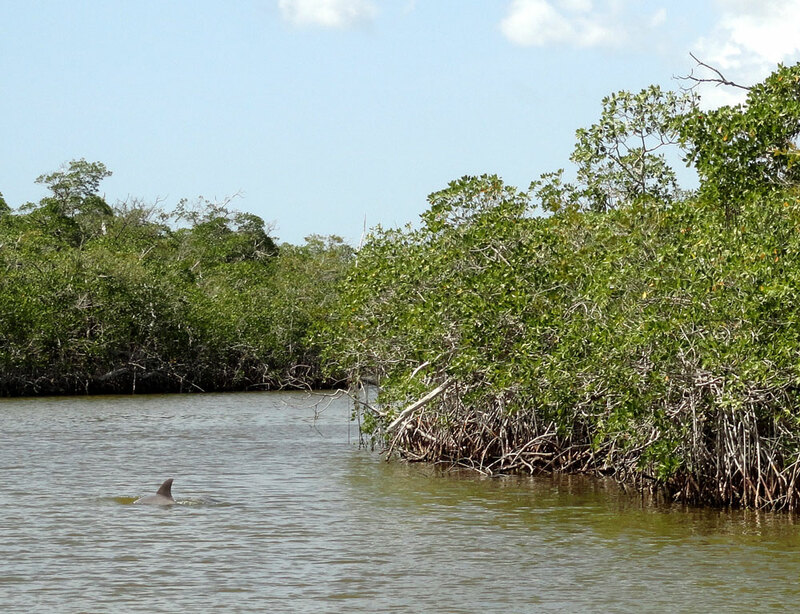 Rangers give information on area wildlife while cruising alongside thick mangrove forests. The highlight of the ride was following two dolphins as they swam into Whitewater Bay. If non-motorized boating is more your style, you can rent a canoe and paddle up the canal yourself. After our boat tour, we looked for manatees in Florida Bay (didn’t see any) and then retraced our driving route back through the park. The Pa-hay-okee overlook gives a fantastic view of the seemingly never ending “river of grass” of Shark River Slough. The Everglades’ environment is considered endangered due to threats by suburban development, intense agriculture and rising seas, and therefore a major pillar of the park’s mission is to restore and promote the natural health of the region. In a good sign, recently a few miles of U.S. Highway 41 were elevated onto a bridge so water can pass underneath, restoring natural flow to a portion of the park for the first time since 1928. More of these bridges are planned to be constructed, ensuring a healthier future for these important wetlands. On the day of our drive from Miami to Key West we made a stop at Biscayne National Park. It is located about an hour’s drive south of Miami Beach on the coast. 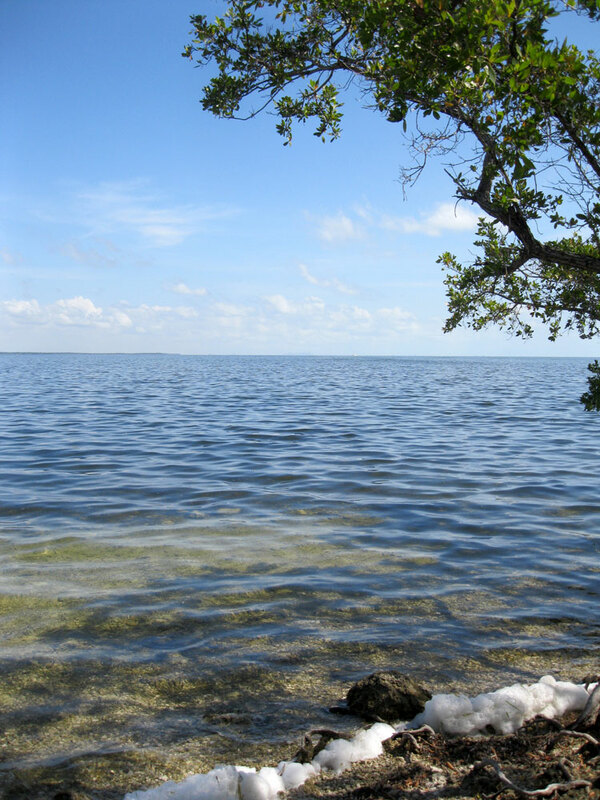 Biscayne protects the waters of Biscayne Bay, mangrove forest coastline, low-lying barrier islands and living coral reefs. 95% of the park is covered by water. Unfortunately for visitors, there is currently no concessioner operating within the park to provide the glass-bottom boat tours and paddle boat rentals that provide the best look at the park. As a result, we knew it would be a fairly brief visit for us. We looked at a schedule of events and found a Sunday 10:00am jetty walk tour, so we made sure to get there in time. Our guide, Summer, took us around the water’s edge near the visitor center Convoy Point and out along a thin jetty poking into the bay. We learned about the history of the area as well as the plant and animal life in the 5 ecological zones that make up the park. There are boat tours into the park available from companies in the Miami area, but our timeframe did not allow that option. The final Florida park we explored was probably the most spectacular of the three. We had known about Dry Tortugas National Park for some time, but thought it was one of those we might never reach. When our travel plans turned to southern Florida, we made it a priority. It’s not a heavily visited park, for the simple reason that it is located 70 miles west of Key West, and the only way to get there is by ferry, chartered seaplane or private boat. The vast majority of visitors arrive on the Yankee Freedom III ferry, the easy and economical choice. The price of $170 for adults ($125 for kids) sounds steep at first, but with it you receive passage from Key West to Fort Jefferson, breakfast, lunch, access to ranger-led tours and complimentary use of snorkeling gear. The ferry makes one round-trip voyage daily, leaving from the ferry terminal on the north side of the island at 8:00am. It takes about 2.5 hours to get to the park. 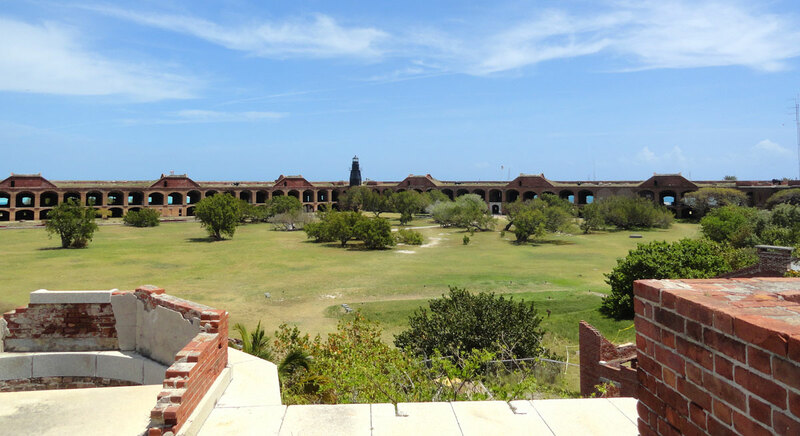 View of the 47-acre inner yard of Fort Jefferson. Dry Tortugas includes the seven Dry Tortugas Islands that make up the westernmost extent of the Florida Keys island chain. They were named the Tortugas by explorer Ponce de León because of the sea turtles that nest on the low-lying, sandy islands. “Dry” was added to the name on maps to indicate to passersby that there is no fresh water available there. More than 99% of the 100 square miles that make up the current park is covered by water. It primarily protects the marine ecosystem including the most pristine of the coral reefs in the Keys region. In addition to the natural habitats, it also preserves a historic fort. In 1822, after Florida became part of the United States, it was determined that military fortification was needed in the Gulf of Mexico to protect American shipping routes between the Mississippi River and markets on the eastern seaboard and Europe. The Dry Tortugas were found to be ideal because of their position and the natural deep harbor that could shelter many navy ships. 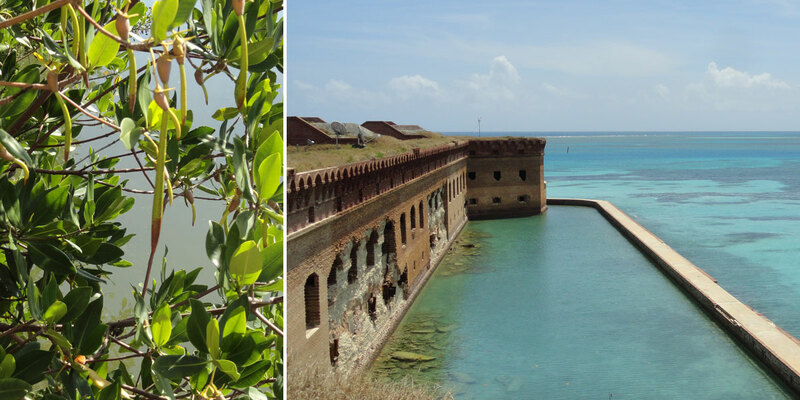 One of the keys, Garden Key, became the base of the enormous Fort Jefferson, a 430-gun “keep out” sign. Work was begun in 1847 and continued through the Civil War while it remained in Union Hands. It was never fully completed, and only 130 of the planned 430 guns were installed, but what exists is still an enormous construction of 16 million bricks. Nobody ever dared fire upon it, but it served as an important strategic defense and a wartime prison. Yankee Freedom III preparing for departure. Approaching this massive structure by boat after 70 miles of open water is somewhat surreal, it just appears in the horizon smack in the middle of the Gulf. The Yankee Freedom III docks near the fort’s entrance and remains there until the 3:00 departure time. With those 4-5 hours, you are free to explore the site at your own pace. We started out by taking advantage of the free snorkeling gear, paddling around the small beach area and amongst the colorful coral formations around the former coaling dock pillars. After drying off, we returned to the boat where lunch was being served. It’s just a sandwich bar, but it hits the spot. We signed up for a 1:00 tour with ranger Bruce that took us all around the fort and gave a detailed view of its history and current state. Since he had a small, attentive group the tour lasted much longer than the planned 45 minutes. Visitors can walk the perimeter of the fort on the roof level or around the moat wall at the water level. The beach area to the south of the fort is also available for overnight camping if you bring your own equipment. Last call for boarding the ferry for the return trip is 2:45. We grabbed seats on the open upper deck and enjoyed the sunny and breezy cruise back to Key West. We added extra enjoyment by buying some booze from the on board bar. 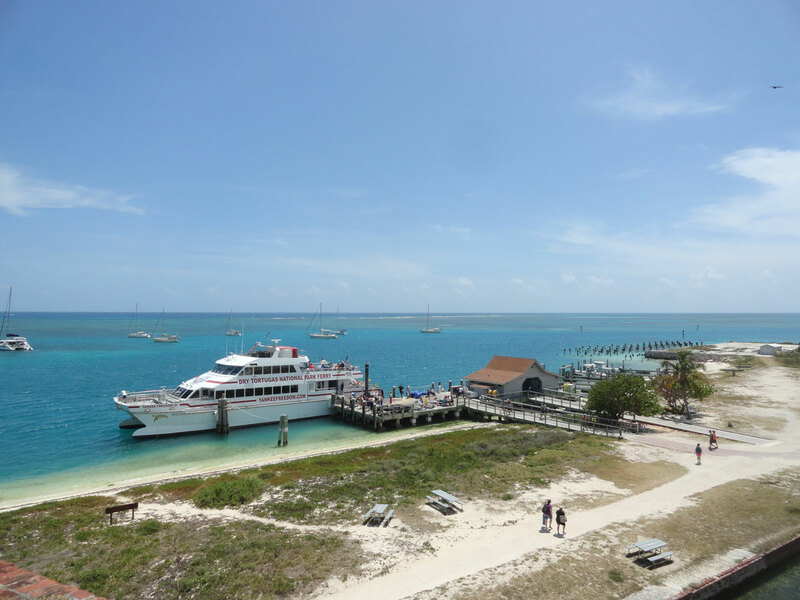 After our day at Dry Tortugas, we were already placing it among our favorite National Park experiences. Of special note is that our entrance to Biscayne marked the halfway point in our National Park tally. We’ve now visited 31 of the total 59. This summer we’ll be taking that up to 38 with our soon-to-be-detailed road trip route. See the full gallery of images from our trip here. This entry was posted in Destinations, Travel Resources and tagged Biscayne National Park, Dry Tortugas Ferry, Dry Tortugas National Park, Everglades Boat Tours, Everglades National Park, Florida National Parks, Florida Road Trip, Yankee Freedom III. Bookmark the permalink.